Motorola is offering workers a chance to reward friends and family with a discount on the Moto X if they agree to test the online Moto Maker configuration system. The Google-owned hardware company is offering $200 or more to those who test the online customization program and provide feedback on the ordering process and the device itself, according to program details seen by AllThingsD. Some participants can get a further $250 in incentives by providing additional information in an interview with Motorola. 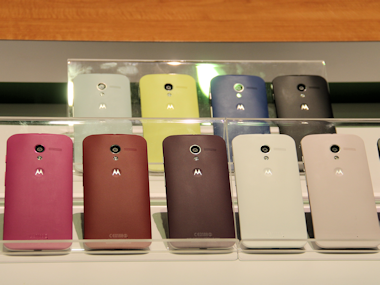 The Moto Maker system, initially available only for those buying an AT&T version of the phone, allows users to choose the color of their device as well as configure the memory and some software elements of the phone. The friends-and-family testing program, announced to workers earlier on Monday, is designed to be a short, limited-time effort. The program offers participants a $100 discount on the device at checkout and a further $100 if they provide feedback within two days of getting the phone — essentially making the 16 gigabyte version free (with a two-year contract). Given the tight time frame and specific needs, Moss said an internally led program was the easiest option. Motorola has been trying some unconventional moves in its drive to promote the Moto X — efforts that have included a private event with bloggers and Guy Kawasaki and a launch that featured no main speech, instead giving journalists more personal time with the phone and top company executives.